Part 1 of the Housing (Wales) Act 2014 introduces important new obligations on landlords and agents. If you own or manage a rented house in Wales, this new law will almost certainly apply to you. Rent Smart Wales was launched on 23 November 2015. 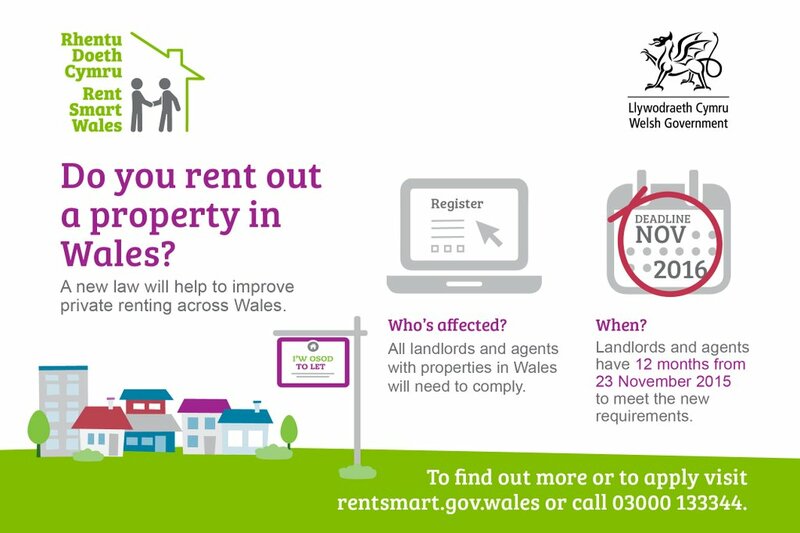 All landlords will need to register and this can be done through the website at www.rentsmart.gov.wales. Landlords will also have to comply with a Code of Practice. Registering online costs £33.50. If you only have a small number of properties it's easy and quick to do. Unless you engage an agent to manage your property, following registration you will then also have to become licensed. You will need to complete an application online or on paper and sign a 'fit and proper person' declaration. The licence costs £144.00 for an online application. There is only one licence per landlord irrespective of the number of properties, but where a property is jointly owned and both owners are involved in management they would each need to be licenced. If you are a landlord who engages an agent to manage your property you will not need a licence. You need only register. Agents are not able to register landlords on their behalf unfortunately. Once you have registered you should provide your registration number. Please note that this is not a voluntary scheme, and there are very few opt-outs. It applies to everyone who receives rental income from a property located in Wales, even if they themselves live in England or overseas. However enforcement does not start until November 2016 and during the first year there will be a focus on raising awareness of the new requirements and encouraging compliance. We will be happy to provide further information regarding RentSmart Wales. Please call us on 02920 703 681. We will also be happy to discuss preferential management terms with any landlords who do not wish to go through the licensing process.